This past December I took the train from Budapest to Lviv. Sitting in the compartment I had ample time to study the timetable and all the stops that would be made along the way. A few of these were at bigger localities, only one of which I lacked any knowledge of, which was the city of Stryi, Ukraine. The spelling of Stryi’s name is so close to that of the Austrian province of Styria that superficially at least, it lacks the exoticism and uniqueness that to me defines the eastern hinterlands of Europe. Since Stryi was also not very far from Lviv, my thoughts tended to jump ahead to my ultimate point of arrival. I overlooked Stryi because I was nearing that final destination. It was also pitch dark when the train stopped at Stryi, with little of interest to see from the compartment window, unless one counts an empty grocery store parking lot. It was only six months later that I finally decided to learn more about Stryi. Fair or not, in the age of internet research a place like Stryi is mostly defined by its Wikipedia entry. Being interested in Stryi’s more recent history I scrutinized the paragraphs covering its 20th century history. Stryi had the usual horrific events that decimated the Austrian administered province of Galicia, the Western Ukrainian People’s Republic, the Second Polish Republic, German Occupied Ukraine and the Soviet Union. The fact that each of the aforementioned political entities all ceased to exist gives an idea of just how calamitous the past one hundred years was for Stryi. Two World Wars, multiple occupations, inter-ethnic strife and a Holocaust that destroyed almost its entire Jewish population is enough to make any reader shutter. 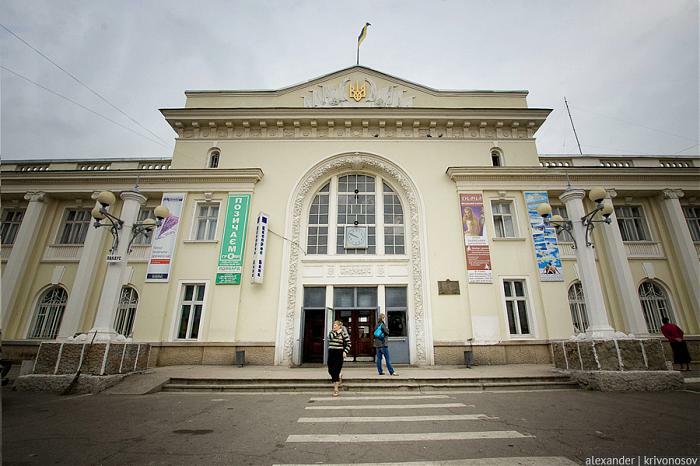 Tragically, Stryi’s past is part of a common history throughout the region. Of course, the Wikipedia entry could not come close to communicating the magnitude of this nightmare of history in a mere eight sentences. Nevertheless, one sentence stood out from all the rest for shock value. It did not have to do with Stryi specifically, but concerned an event that occurred nearby during World War I. The sentence said, “In 1915 a bloody battle took place in the Carpathian Mountains, around the peak of Zwinin (992 meters above sea level), a few kilometers south of Stryi in which some 33,000 Russian soldiers perished.” The mention of Zwinin (Dzhvynuv in Ukrainian) piqued my interest, specifically because I had never heard of the battle. Of course the Carpathians were the scene of deadly fighting throughout the winter and spring of 1914-1915, but the unending fighting that occurred makes it hard to separate battles from campaigns. After locating Zwinin on a map I discovered that it was more than a few kilometers south of Stryi, it was actually around twenty kilometers as the crow flies from the city. It is just as remote today, as it was in 1915. Zwinin, due to its natural beauty and remote wilderness, is now part of Skole Beskids National Park. During World War I, that beauty was not on anyone’s mind, but a certain manufactured aspect of wilderness was. From February 5th through April 9th, 1915 Zwinin became a setting for the wilderness of war. Discovering what actually happened at Zwinin is difficult. The battle is shrouded in obscurity. On one side were Russian forces attempting to push through the Eastern Carpathians and break into the Great Hungarian Plain, where they would be able to ravage the breadbasket of Austria-Hungary and knock it out of the war. On the opposite side were forces from the Central Powers, faltering Austro-Hungarian troops now stiffened by soldiers and leadership from their German allies. Between these armies lay mountainous terrain like Zwinin. The topography of the Beskid Range in the Carpathians, created an even greater obstacle than any army. Frigid temperatures and snowstorms added another layer of problems. Interestingly, searches on “Battle of Zwinin” or “World War One Zwinin” brought up more images than information. 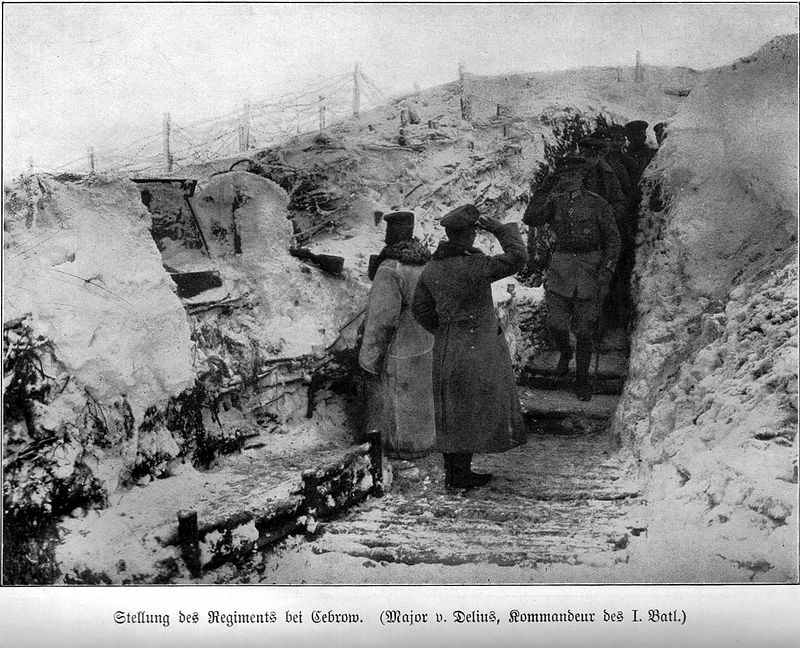 One photo showed a German officer being saluted as he walks through a snowy trench. 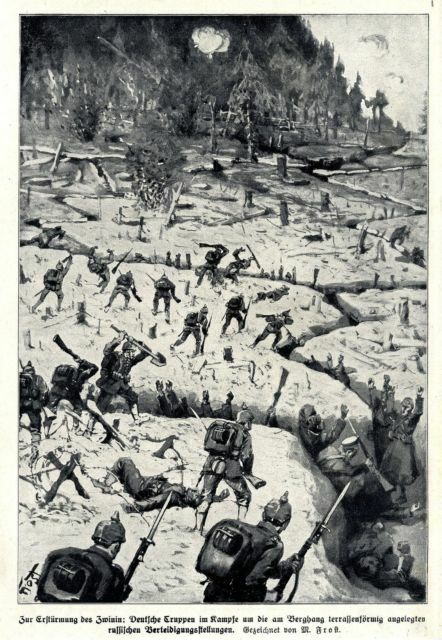 The icy scene gives new meaning to the phrase, “No Man’s Land.” Another image was an artist’s rendition of the storming of the east end of Zwinin that occurred on the final day of battle. Russian soldiers surrender or are killed by German forces crossing a gnarled, snow covered no man’s land on their way up the mountain. 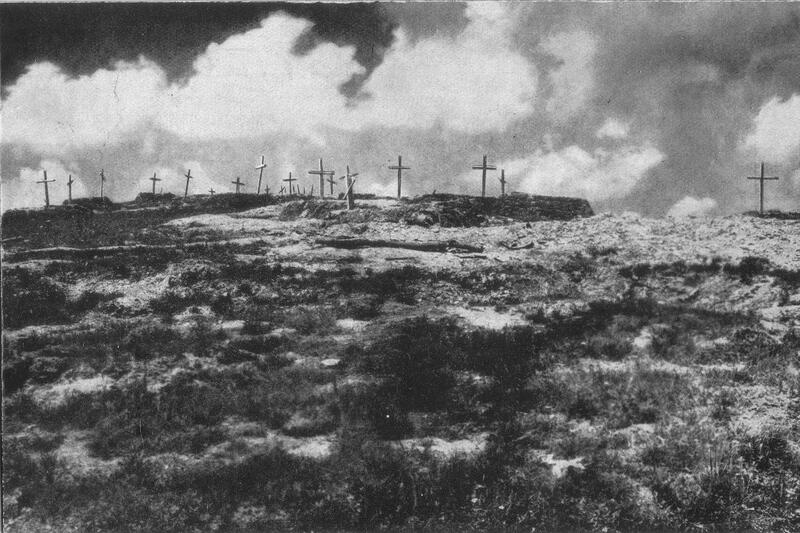 A final photo shows a series of crosses on top of Zwinin, makeshift graves covering the inhospitable prominence. What does all this have to do with Stryi? It seems, on the face of it, not very much. Yet there was one other image on a postcard that I discovered which stands out. Roughly translated it says, “Stryi after taking the Zwinin. 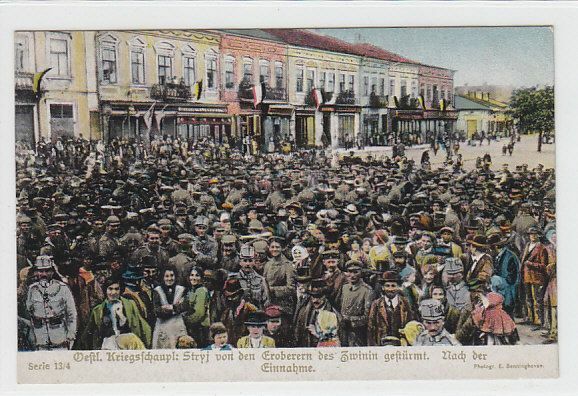 The city is decorated with German and Austrian flags.” In it a crowd of soldiers and colorfully dressed civilians smile pleasantly while standing in the city center of Stryi. The Russians had been vanquished from both the Beskids and Stryi, a victory had been won. What is not shown in the photo and what we can never know is how many soldiers would be in that photo if the battle had never occurred. The German and Austro-Hungarian forces had been victorious, but battles like Zwinin took thousands of lives. All this really did was reclaim for the Austrians a relatively, small insignificant city in Galicia. They once again held sway over the city of Stryi and the wilderness that lurked just beyond the edge of it. The victory was part of an effort to keep an empire (from the Austro-Hungarian perspective) and an ally (from the German perspective) from crumbling. Were these reasons enough to sustain such losses? Stryi had only a handful of ethnic Germans. It was a city that had been held for nearly a century and a half prior to the war by the Austrians with barely any bloodshed. Zwinin and Stryi mattered, only if the illogical course of empire was followed. As for the Russians, they lost 33,000 men, what amounted to a few infinitesimal snowflakes amid an avalanche of violence that buried hundreds of thousands in a frozen mountain wilderness. As many or more Russian soldiers died from exposure to the elements, as would from enemy fire. This was just the start of a massive retreat back to western Russia, where the Russian army would be only six months later. The Russians would come back to Stryi, less than thirty years later, this time as Soviets. Millions upon millions of lives were lost along the way in a long, horrifying journey that took years. The rewards were places like Stryi, a nearly anonymous city that turned out to be irrelevant in the grand scheme of things. As it was then, as it is today, an afterthought on the way to more important places.